Everyone promises to look me up on the web. But for one reason or another, probably that the name is sort of cumbersome, nobody remembers the URL. And that’s not limited to people I meet for the first time. Good friends can’t seem to get a handle on it either. So today I headed over to Merrymaker, my stationers in Richmond, to have a card made up. Of course it wasn’t that simple. So to help me with the multitude of decisions I had to make, I went to the source — calling cards are very 19th century London. After consulting my DeBrett’s, I realized I was about to design a woman’s card — and very fast sort of woman, too. A quick email to an art director friend, and another to the unfailingly tasteful architect, helped sort things out. That’s the advantage of having an aesthetics committee to consult. One is my “business card” and the other my calling card. Both are to be engraved on triple thick white card stock with black ink. Unfortunately, one of the fonts I wanted isn’t one of the standard offerings, so the results are a tad more conservative than I thought that I would wind up with. But they should be beautiful. Of course I have to add my first initial and fix the name of the site on the draft (above) designed by my art director friend. But what’s in a name, right? And after handing out an engraved card heavier than a Chinette paper plate, I bet it’ll be more memorable. Or at least easier to find in a crowded wallet. 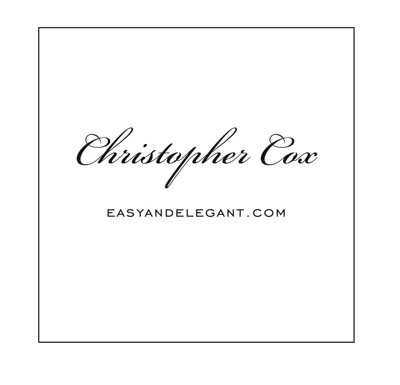 This entry was posted in Elegantology and tagged Calling Card, DeBrett's, engraving, ettiquette, stationery. Bookmark the permalink. is the bickram (?) font? i just used it for our company christmas… oops, holiday cards. there are two versions of it, one is a little more decorative. Yes it is Bickham (?) Script for the address and Bickham Swash (the more elaborate) for my name on the calling card. The other is Bickham Script and Engraver’s Gothic for the card pictured above. What I can’t decide is whether or not to include my full address or leave it at Richmond, Virginia on the calling card. leave it at richmond, the great walled city! I think I shall. Thanks! What’s wrong with fast women?! I daresay I would not have “caught” my husband had I not been a bit aggressive . . . I have a traditional business card but I asked my son, who is a design major at college, to create for me a distinctive sort of “calling card” (fast woman that I am) with only my name, cell, and email. I only distribute my work card at conferences and I wanted something that was more “me” to give to friends. Partly because I want to keep it pared-down and partly because I move a lot, I will forego the address. He’s deeply into Art Nouveau right now, so it will be interesting to see what he comes up with! Absolutely nothing. Had you been witness to my first encounter with the then Ms. E., I’m sure you would have seen a kindred soul. Her first words to me are unprintable. It was the start of a beautiful relationship. I only made the comment as Mr. Morgan of DeBrett’s writes in reference to the size of a lady’s calling card during the 19th century. It seems that using the smaller size associated with a man’s card made it easier to “hide” in the pile on the salver. I meant no offence and can only offer sincere apologies if I have give any. As the saying goes: Dying is easy; Comedy is hard. Best of luck to your son. Having worked with many designers, I am awed by their abilities. Of course no offense taken! Interesting that, in the case of calling cards, size matters! By the way, I enjoy your blog, thank you!